Spanish tradition and flavors inspire and inform the menu at The Iberian Pig in Decatur. 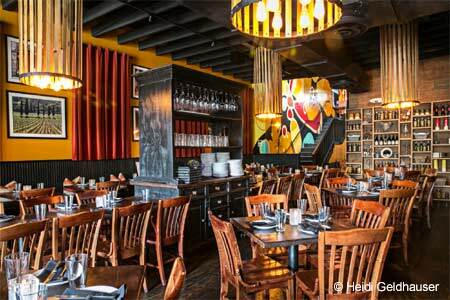 : The Iberian Pig exhibits lots of wood and warm lighting, and noise levels can get somewhat intense when the place fills, so we suggest going early. Ask for a table in the small enclave in front of the windows. As for the menu, pork appears as sweet, tender cheeks braised and paired with a poached egg and truffle or filling a taco. We like the veal shank-stuffed ravioli and the suckling pig-stuffed tortelloni. Try the wild boar meatballs and the classic patatas bravas, too. Meanwhile, the hanger steak was a good, heftier dish, and the kitchen was able to swap out queso fresco (which is Mexican) for tangy Cabrales from Asturias. On a previous visit, the jamón de Bellota was disappointing, but on this visit it was sweet, fat-flecked and tender. A few items make use of blood sausage, morcilla and Spanish cheeses. For dessert, get the flan or the churros with their side of hot chocolate. The wine list features Spanish labels, mostly reds, but there are options from other parts of the Hispanic world. If you're looking for a fino or Manzanilla sherry as an apéritif, you'll find them noted with dessert wines. Sangria (red or white) and craft cocktails are also on offer.